I went along for the tricorn hat draw with my head packed with vague notions. Notions about 18th century Britain, the downsides of industrialisation, man’s inhumanity to man (or, rather, to woman and child) and the beginnings of modern philanthropy. I already knew a little about the Foundling Museum and Thomas Coram. I’d been to the museum a few years earlier while working on a BBC project about family history. I’d read Jamila Gavin’s dark story, ‘Coram Boy’, to my son and we’d seen it staged at the National Theatre. But now I was back with a new purpose. We 26-ers were given an intimate tour of the museum and I saw much more than I’d seen on the previous visit. My vague notions were filled out or replaced. The Foundling Hospital came to life for me as somewhere that had provided sanctuary for thousands of children over two centuries – starting as Britain fast became the world’s economic super-power, a power that cared little for its most vulnerable citizens. I thought of the 21st-century street children I’d seen in Delhi. Moral values are relative to time and place. They shouldn’t be but they are. The Hospital may have been a sanctuary, but it was a harsh one. At best it meant graduation to a life in service – the armed services for boys, domestic service for girls – and perpetual gratitude to the orphanage for saving them. At worst it meant death. Children still died in the orphanage in the 1700s, but not in the numbers or the squalor that they did on the streets. Ideas grew as we walked round. There were so many objects that took my fancy. The tokens left by grateful mothers, original documents telling real stories, portraits of fashionable benefactors (the Bill Gateses of their day? ), more Hogarths than I knew existed, Handel’s will…. Then came the draw and the matching of writers to objects. I was paired with ….a clock. More precisely, a walnut longcase clock, made and presented to the Foundling Hospital in 1750 by John Ellicott, later clockmaker to George III. Admittedly a very fine clock – but nonetheless a clock. All my ideas about desperation and 18th century morals fell by the way. This felt very utilitarian. Clocks were good for telling the time and this one was also an elegant piece of furniture. But I wasn’t sure that it told me anything about the human condition or that I could see it in any other way than as a timepiece. Still it was my clock for the purposes of this project and I was going to do my homework. I started off with some online research. 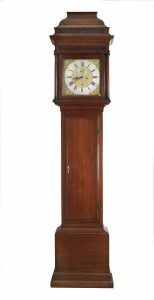 Googling ‘Ellicott longcase clock’ took me to the sites of upmarket antique dealers who would willingly have sold me an Ellicott of my own if I’d had a few thousand to spare. But I also learnt a bit more about John Ellicott, royal clockmaker and benefactor of the Foundling Museum. Not only did he make exquisite clocks, but he was a mathematician and a man of science. He kept an observatory at home in Hackney and invented a new and more accurate type of pendulum. He was, said the Royal Society, ‘an ingenious watchmaker of great note’. I bought a little book about antiquarian clocks and felt a theme coming on here. Scientific progress …..time ….relativity ….a changing world ….changing values. But still it wasn’t quite right. I wanted to get back to the children. I returned to the museum to re-examine the Ellicott clock. On a Saturday afternoon the place was busy and the clock was slightly hidden by a coat rack. I moved it (the rack not the clock) and took a phone picture – somehow I’d forgotten to do that on the previous visit. People weren’t paying much attention to my clock – they were keen to get to the interesting stuff. So I had it to myself for a while. I looked and looked. The second hand completed several circuits while I stood watching, the minute hand jerked forward a few times. This was a moving object. Every time I looked at it, its face was slightly different, yet the same. I also looked more closely at some of the other exhibits – to see if any would shed light on the meaning of the clock. One thing did. A timetable of lessons – a clue as to how the children spent their time. Time. A-ha. I followed this up in a book the museum staff directed me to – David Allin’s ‘The Early Years of the Foundling Hospital’, the most comprehensive and detailed guide you could wish for. And there I found a whole section on the children’s daily routine. Hospital regulations stipulated that they should rise at 5 a.m. in summer, 7 a.m. in winter, and their time was then apportioned to lessons, work, meals, diversion or rest until bed at 9 p.m.
That was it. The clock was clearly the most important object in the museum. It set the children’s routines exactly and inflexibly. It was what distinguished life in the Hospital – outside there were no rules, only dangerous unpredictability. The job then was to turn that idea into 62 words. I’d assume the voice of the perennial clock, keeper of time, overseer of the children’s routine, 265-years-old. Sixty-two words aren’t many. I like ideas and sentences, the conjunction of words, not just words themselves. But they take space. This was clearly going to be a problem for someone who is essentially a prose writer (and, even worse, a journalist), not a poet. My first draft was 111 words – a neat number but nearly twice too many. Nothing is uneditable and I remembered the old journalistic adage: if in doubt, cut it out. But still I got stuck on 84. Almost there at 65. Then I spotted it. Two hundred and sixty-five clock-years equal (rounded down) twenty-six decades. 26? There’s a coincidence. And three words eliminated. Job done. indifferent to life’s excuses, cutting no slack. Yet there’s purpose here and mercy in my methods.